Tired & hungry after shopping all day at the Kittery outlets , Laura and I were on the hunt for food ......not ANY food ......SEAFOOD ! After all , we WERE in Maine . 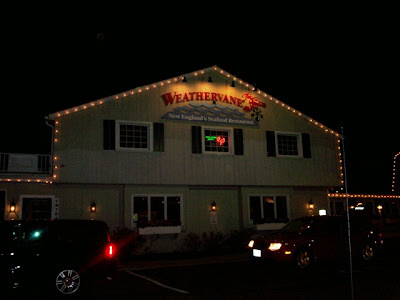 Luckily for us , Weathervane is right in the middle of outlet central . We'd been here before and the food was fantastic . So ....we hurried inside . This place is DARK inside .....REALLY dark . Hey , what are they hiding ? It's cute ! All wood and nautical themed . Nothing to be ashamed of . After we strained to see the menu , we placed our order . 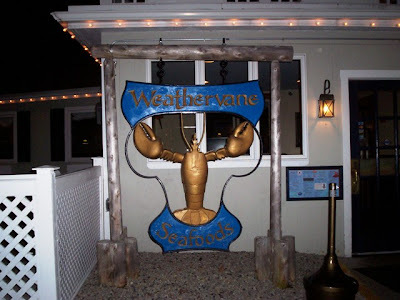 Not cheap ......but it's seafood in Maine .......we expected it . Laura's plate arrived looking a tad overdone and dried out . The topping on her fish was WAY too dry & crunchy . And they had left that strip of silver floss across the bottom of the fish ...which is nasty . Laura said the inside of the fish and stuffing was OK but there was a lot she had to just push to the side . The best thing was her cole slaw . Now comes the jealousy part . 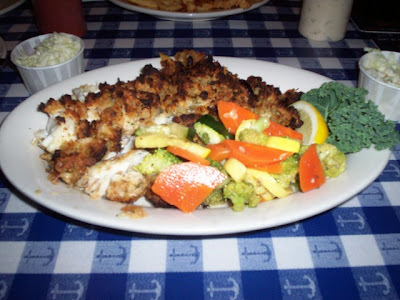 My half & half ( fish/clam strips platter )was a thing of beauty . 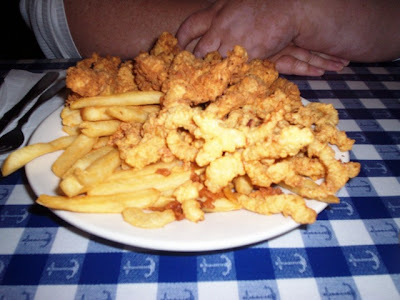 A mound of sweet fresh clam strips joining a pile of white flaky haddock nuggets and topped off with tasty hot crispy fries ...................SEAFOOD HEAVEN ! And it tasted as good as it looked . Everything was cooked perfectly and it was served piping hot ....a pet peeve of mine ( HATE luke-warm food ) . As good as it was , and as hungry as I was ....no way could I eat it all .....the portion was HUGE . SOOOOOOO .....being the good mother that I am ......and tired of Laura sticking her greasy little fingers into my plate ....FOR A TASTE ......I offered to share with her . She really enjoyed it ( as did I ) and said she would definitely get mine next time . If we play our cards right ......that might be this weekend .